1. 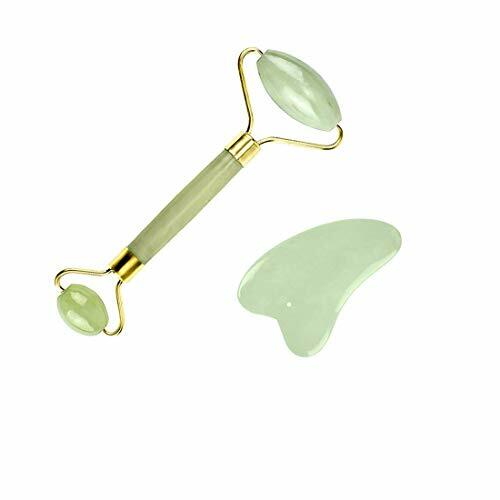 Roller has a double ended roller to accommodate different facial areas: the smaller roller for eye area, while larger one for neck ,face, arms etc. Roll the product in an up and out motion from the neck toward the forehead. How to Use The Gua Sha Scraper: Keep it at a 15 degree angle when moving from the center of the face towards to the hairline, then down the neck towards collar bone. If you are not 100% satisfied with our Gua Sha facial massage kit, please contact us kindly,and we will provide our best service for you. Kindly Tip:Due to the nature of the jade stone,each piece varies in color - from very pale to darker green to opaque and translucent. The stone is hand cut so size will vary.